(Compiled from articles at WSJ and FoxNews) – Turkey said it would seek the extradition of a prominent NBA player, part of a global hunt President Recep Tayyip Erdogan has launched to capture supporters of a Pennsylvania-based Turkish cleric he accuses of [inciting; instigating] the 2016 coup that nearly swept him from power. 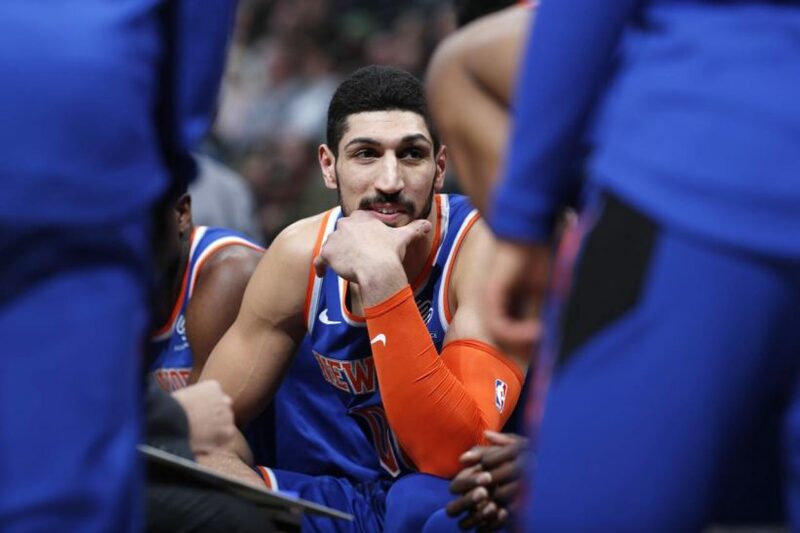 Prosecutors in Istanbul allege that Enes Kanter, a Turkish center for the New York Knicks, belongs to the movement of U.S.-based Turkish cleric Fethullah Gulen, which Turkey regards as a terrorist organization [the U.S. does not], and have …publicized an arrest warrant for Mr. Kanter through Interpol, a Turkish official said Tuesday. The 26-year-old Mr. Kanter, who has been playing in the NBA since 2011, calls himself a “servant” of Mr. Gulen, who lives in Pennsylvania. But the basketball player denies the organization of Mr. Gulen has had any involvement in terrorism-related activity. Mr. Gulen has denied playing any role in the failed coup. 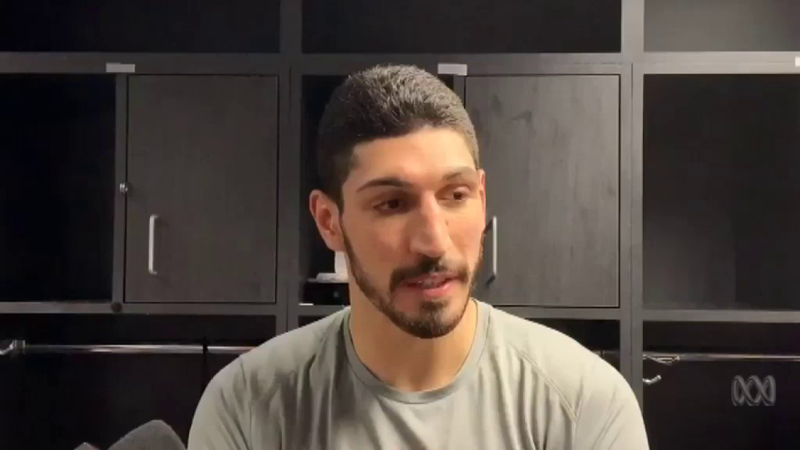 Former Turkish basketball player Hedo Turkoglu slammed New York Knicks forward Enes Kanter over Kanter’s decision to skip a game in London due to alleged fears he could be killed over his opposition to Turkish President Recep Tayyip Erdogan. Kanter has been a vocal critic of Erdogan for years, once referring to him as “the Hitler of our century.” His Turkish passport was revoked in 2017 and an international warrant for his arrest was issued by Turkey. In July, Kanter told Fox News he gets “three or four death threats every week.” He said he believed the threats are from pro-Erdogan supporters both in Turkey and outside of it. Kanter said he feels safe in the U.S.
“But anywhere outside America would be very dangerous,” he said. Compiled from reports by David Gauthier-Villars at WSJ.com on Jan. 15 and Ryan Gaydos at FoxNews on Jan. 7. Reprinted here for educational purposes only. May not be reproduced on other websites without permission. b) For what reasons has the president of Turkey issued an arrest warrant with Interpol for Turkish NBA player Enes Kanter? c) Why did Kanter skip his team’s game against the Washington Wizards that was played in London last week? What did he say? d) Kanter said he feels safe in the U.S. “But anywhere outside America would be very dangerous,” he said. -What is your reaction to the fact that Mr. Kanter trusts the U.S. but not UK government to keep him safe? -How do you think the government of Turkey views the U.S. if they would not try to do anything to Mr. Kanter here, but might in the UK? The developments mark a dramatic escalation in Mr. Kanter’s protracted feud with Mr. Erdogan, which traces to a 2016 incident, and provide a measure of the extent of Turkey’s efforts to prosecute sympathizers of Mr. Gulen. Turkey has submitted a formal request to the U.S. seeking extradition of the 77-year-old cleric, but U.S. officials have said evidence Turkey provided didn’t meet the legal standard for extradition. President Erdogan [a devout Muslim who is transforming Turkey’s government from secular to Islamic] and Mr. Gulen were once allies. The Turkish leader leaned on the cleric’s movement to thrust scores of young graduates groomed by Mr. Gulen’s sprawling network of [Islamic] schools into the Turkish administration. Since the 2016 failed coup, however, the Turkish leader has purged the state apparatus of tens of thousands of civil servants he suspects have had sympathy with Mr. Gulen. Mr. Erdogan has also ordered the national intelligence agency and other security institutions to pull out all stops in hunting for suspected Gulenists [Muslims who follow Gulen’s Islamic teachings] overseas. Turkey says it has snatched over 100 suspects through different operations in places ranging from nearby Kosovo to far-flung Malaysia. Turkish authorities narrowly missed an opportunity to detain Mr. Kanter in 2017 when he made a layover in Romania. He was detained at the airport because, unbeknown to the athlete, Turkey had canceled his passport and issued warrants for his arrest. With support from the U.S., Mr. Kanter managed to avoid being sent to Turkey. The warrants stemmed from a pair of complaints that Mr. Erdogan and former NBA player Hidayet Turkoglu, who was known as “Hedo” during his basketball career, had filed against Mr. Kanter over alleged insults. An official with the Turkish presidency didn’t return messages seeking comment. Through a spokesman, Mr. Turkoglu declined to comment. In an op-ed article published in the Washington Post on Tuesday, Mr. Kanter said he knew that singling out the president of Turkey would land him in trouble but never thought it would reach such an extreme. The player has said the situation has left him estranged from his family living in Turkey. While the two insult cases are pending, Messrs. Kanter and Turkoglu have continued sparring over social networks. Last week, when Mr. Kanter first announced that he wouldn’t go to London because he feared for his life, Mr. Turkoglu published a statement in English, German and Turkish accusing him of conducting a smear campaign against Turkey.